There are so many reasons to take up paddle boarding. It’s great exercise, a new way to see the world, and best of all, a fun-filled family activity. If you have children, studies show that sharing your hobbies with them and taking them along on family vacations have permanently positive impacts on their development. Getting ready to hit the water and go paddle boarding this summer? Now is the time to bring your children with you. Whether you’ve been paddle boarding for years and now want to involve your children, or if your whole family is learning together, it’s important to choose the best paddle boards for kids. In this post, we’re sharing with you some of the safest and best paddle boards for kids. Read on to make sure you have all the equipment you need to make lasting memories with your children. 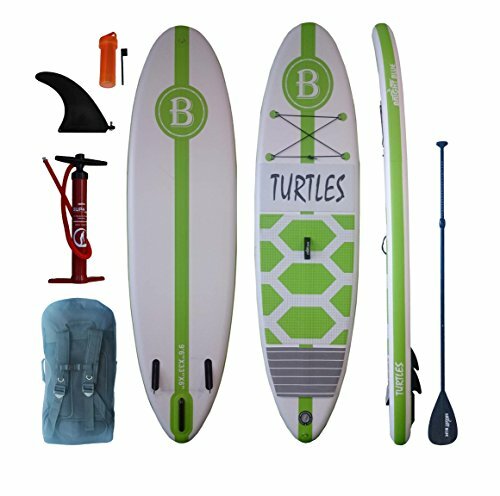 The Kid Stand Up Paddle Board 9’6″(6″ Thick) is a great starter board, plus who can go wrong with the turtle print! Before we dive into our list of recommendations for the best paddle boards for kids, let’s quickly go over a few important details. First of all, let’s talk length and width. In general, children-sized paddle boards will be around 8 feet long, and between 29-30 inches wide. Children’s paddle boards are a bit skinnier than adult versions because this makes them easier for kids to steer. Additionally, most paddle boards for kids won’t be quite as thick as adult versions. This is, once again, because it’s easier for children to maneuver. But, thinner boards are also safer for children, as they aren’t designed to hold as much weight as their adult-sized counterparts. Lighter, less cumbersome boards ensure that children can get help more quickly should they need it. They won’t be weighed down by heavy boards. Paddle boards for kids are a bit more versatile than adult versions and can be taken surfing or cruising. Children’s boards also don’t have the trademark curve of adult’s boards, since they waves they’ll be riding will be much smaller in size. Additionally, they may also have a foam tip to make the board even lighter. Finally, remember that your child’s size, skill level, and even the area where you’re paddle boarding will all influence the type of paddle board you purchase for them. One feature you should consider for your children’s paddle boards? A board leash — especially if you’re planning on boarding in deeper waters. This will help to keep your children tethered to their board. It will also make it easier for you to spot them if there’s a problem. Now, let’s move on to the best paddle boards for kids! This paddle board truly has something for everyone. Your children will love the bright yellows, red, and oranges — and you’ll love the safety features. Especially if your child is under 100 pounds, this light board is a wonderful option. In fact, it weighs under 20 pounds! If your child is an absolute beginner, this is the board for them. It’s incredibly easy to maneuver, which will help your child develop the confidence they need on the water. We also love that this board comes with its thruster fins fixed onto the board, making them nearly impossible to lose. When you purchase this board, you’ll also get a backpack for easy storage, a kit for repairs, and a handheld pump along with other basic tools. This means that children won’t just learn about how to ride — they’ll also learn about the responsibility and importance of taking care of their boards. This is a wonderful option if you’re taking your child paddle boarding on a lake or relatively calm waters. If you’re looking for the best paddle board for kids that struggle with balance, then this board will likely be your top pick. It’s also a great choice for those children who have a tendency to lose or break things — no matter how “unbreakable” those items claim to be. It’s one of the more affordable options on our list of the best paddle boards for kids. It also comes in a variety of colors, so you can be sure to get it in your child’s absolute favorite color. The makers of this board worked to strike the perfect balance of length, width, and board thickness. Its design is specifically focused on making standing up as easy as possible. This also means it’s a solid option for waters that might get a bit rough at times. It’s made from patented “DURA-TEC” material, designed to stand up to even the harshest of waves. This also means it’s ideal for older children who might be a bit more advanced than others. We also love that this board comes in a variety of different sizes, meaning that you can make the best choice based on your child’s height and weight. Finally, it comes with anchors you can rig onto a deck. Perfect for when you need to stop for a snack break! Many parents love the ease of an inflatable SUP when it comes to finding the best paddle boards for their children. Plus, they don’t take up too much room in the car! We love this paddle board because it comes with so many different features and tools. You’ll get an air pump, a backpack for easy storage, and more. This option on our list of paddle boards for kids is designed to be for children that are 100 pounds and under — meaning it’s especially ideal for young children. This paddle board is a little bit more of an investment than some of the other options featured here. This means that it’s ideal for a family planning on taking several paddle boarding excursions throughout the year. If you’re concerned that something might pierce an inflatable SUP and leave your child stranded on the water, don’t worry. Lucky Bums has used Military Grade PVC to ensure this doesn’t happen — and includes a repair kit so you can easily fix any snags. It also comes with an aluminum paddle and fins, which helps to justify the slightly higher price tag of this paddle board. If your child wants to be the most fashionable paddle boarder on the water, then look no further than this board! In either pink or grey, it’s available in an awesome camo print with a smiling emoji. Since this board is specifically designed for young learners, you’ll get a lot of advantages here. We love that it comes with a sturdy grip deck, so your children can master standing up even faster. The boards also come with a special mount and bungee cords. This makes them the ideal choice for linger trips. If you need to bring anything along with you, use the mount and cords to help. If your child isn’t exactly gentle with their toys, then this is likely your best bet. The board is drop-stitched and designed to offer the strength of a hard-surface paddle board — but in a safer, kid-friendly inflatable material. It’s also an ideal choice for older or heavier children, as this board can support up to 155 pounds of weight. Finally, it comes with an ankle leash, ensuring that your child is never separated from their paddle board while out on the water. This board has long been one of the most popular paddle boards for kids. If your child is willing and able to carry a board that’s slightly heavier than some of the other options on our list, we think this board is well worth the weight! Because it’s thicker, it’s the right choice for boarders who are planning on potentially hitting some rougher waters. It’s also a wonderful option for more advanced riders who like to do a lot of different types of activities on their boards. In fact, it comes equipped with three different flexible fins — so you can coast surf, or do whatever else your heart desires! The surface of the board is made of “extra grip” material, designed to help your child to stand up for longer periods of time. It also has handles, meaning it’s a great choice for those children who plan on going on multiple rides throughout the day. Finally, this is the best choice for those parents who want their child to be able to use this board for a long time. This is because it comes with 4 D-Ring attachment places. This means that your child will be able to adjust the board to their riding skill set, changing height and weight, and current riding conditions. Keep in mind though, that the low price tag means you’ll need to buy your accessories, like your pump and paddle, separately. Unlike some of the other options on our list, this option on our list of paddle boards for kids is not a complete kit. This board is the last option on our list of the top paddle boards for kids. First of all, at under $300, it’s certainly one of the most affordable options on our list. We also love the awesome striped pattern, making it perfect for either a girl or a boy. It’s also an ideal board for heavier or older children, as it can hold up to 176 pounds. This board might even work well for your teenager riders, as it can stand up to the weight of a sudden growth spurt! It even comes with a paddle and leg strap, which makes the price even more attractive. But it’s the features of the board that really make it one of the great paddle boards for kids. It’s designed with several side chambers that help to improve balance and keep things stable. It also comes with a built-in splash guard, making it ideal for waters that can get a bit choppy. While most paddle boards are ridden standing up, especially if you’re on the seas for a while, you can start to get pretty tired! This is all the more true if you’re a younger rider. That’s why we love that this paddle board comes with an attachment for a seat. Finally, one of the best features is the surface of the board itself. It’s made from easy-grip EVA, which will help your young rider be able to stand for long periods of time! It’s also easy to move around on this board. For a young beginner, who is still struggling to find the proper footing, this is a wonderful feature. One last word of advice: when boarding, always be sure to wear sunscreen and, most of all, to stay hydrated. While it’s not necessarily the most strenuous activity, it’s very easy to get overheated — especially for young children. Always encourage your kids to wear a hat and sunscreen, and be sure to pack plenty of water. Looking For More Information On The Best Paddle Boards For Kids? Hopefully, this post has told you what you need to look for when buying a paddle board for your youngest riders! Additionally, you now have a variety of possible options to choose from. Of course, finding the right paddle boards for kids is only part of planning the perfect family adventure! You’ll also need tips on how to ride, an idea of the best destinations out there, and of course, information on how to pick out a paddle board of your own! Even if you’ve crossed one thing off your “to-do” list, as you can see, you’ve still got a lot to do. But don’t get stressed — we’re here to help you get organized! No matter your skill level or interest level, we have the information you need about how to get the most out of your next paddle boarding experience. Be sure to check out our websites, and especially our reviews of the top paddle boards on the market to learn more. If you have any questions or concerns, always feel free to reach out to us with them! You’re ready to take a vacation with your children that no member of your family will ever forget — with the best paddle boards for kids!